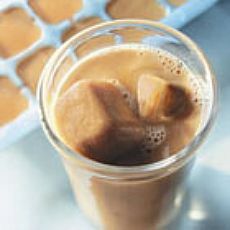 my friend, a food and wine lover, just passed me a recipe from the new york times for an cold-brewed iced coffee concentrate. after expressly extolling it’s virtues,Â he’s gotten meÂ all riled up about it. apparently, thoughtful preparation of this not-too-difficult prescription results in some type of ambrosial elixir that is smooth, satisfyingÂ and full of sublime coffee flavor. being a bon vivant, i needed little time to prepare myself mentally for the exquisite pleasures of coffeefantasyland, and now i’m ready to taker the, er, plunge. after the requisite 12 hour steeping time, i can’t think ofÂ a better place to put my slippery, filled-to-the-brimÂ glass than these big head coasters. 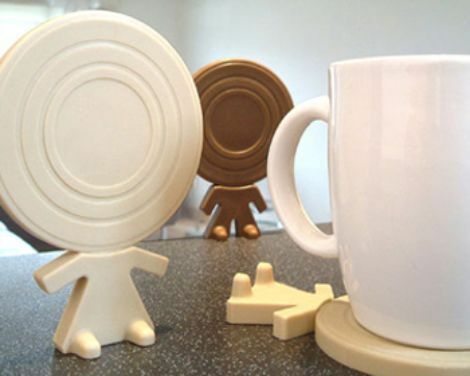 these clever drink holders are made of thick rubber, and as you can see, you can stack them or stand them. 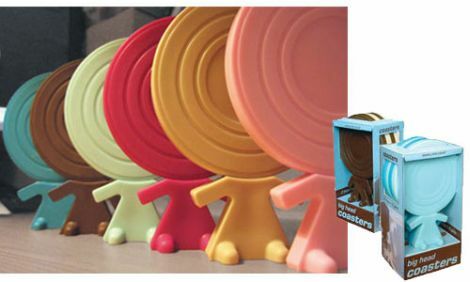 they come in packages of 4, in assorted colorways. buy them online at wrapables or perpetual kid, andÂ don’t forget toÂ savor each sip!